How to change the number of users? 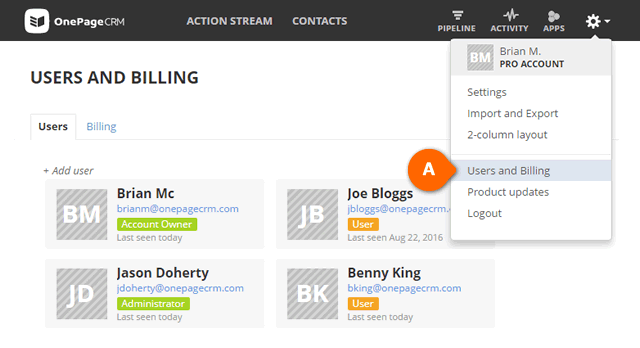 Once you are subscribed to OnePageCRM, you can easily purchase additional users. You can also have the option to reduce the number of users on your account. 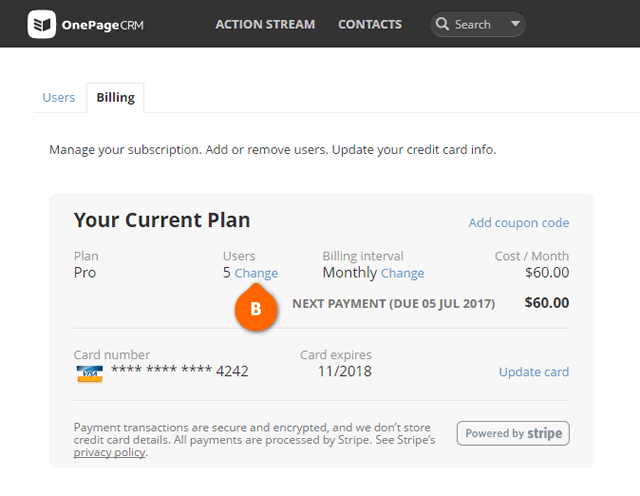 Under Billing > Your Current Plan, click on the Change link (see B) to the right of the current number of users. Increase or decrease the number from the Number of user drop-down (see C). If you increase the number of users you will be charged for the additional number of users immediately. If your are on a Trial account, there is no charge for additional users. Only Account Owner or Administrator can add or remove users. Pro-rata rates apply for purchasing additional users during your monthly/yearly subscription period. In case an additional user is removed, this action will take effect on your next billing date. For example, if your billing date is on the 1st of the month and you removed a user on the 15th of the month, your removed user still can access their account until the 31st of that month. Starting from the 1st of the next month your user will no longer be able to use their account and your credit card will be charged for OnePageCRM by the number of users less the one removed. The number of users can only be downgraded to the number of active users on the account. If you remove a user on the gear icon > User page, the Number of users drop-down value will automatically be updated with the actual number of active user. For example, you have 3 active users on your account under User page and you have 4 users purchased on the Subscription page. You want to reduce the number of users to 2, first you will have to remove a user on the User page and then you will be allowed to reduce the number of users on the Subscription page.